"War is not a polite sport, but the vilest thing in life. We must understand that and not play at war." Leo Tolstoy's massive novel of the Napoleonic Wars, War and Peace, is a sprawling mass of characters and events, studded with historiographical essays on the nature of historical events and the effect, if any, that man can have upon them. Although much of this is not suitable for cinematic use, there are several narrative threads that have captured the imaginations of filmmakers. Russian actor-director Sergei Bondarchuk tried his hand at an adaptation resulting in four movies totalling nearly seven hours, the most expensive film ever made, if inflation is taken into account. The narrative here follows three characters in the period 1805-1812: Prince Andrei Bolkonsky (Vyachaslav Tikhonov), a military man; his friend Pierre Bezukhov (Bondarchuk), an intellectual nobleman of illegitimate birth; and Natasha Rostova (Lyudmila Savelyeva), a young girl coming of age. Part I focuses on Bolkonsky and his strained relationship with his father, his service at Austerlitz and his discussions with Pierre. Part II focuses on Natasha and her first loves, Bolkonsky and Anatol Kuragin (Vasily Lanovoy). Part III, subtitled "1812," centers on the French invasion of Russia and Napoleon's Pyrrhic victory at Borodino, where Bolkonsky is a commander and Pierre, who begins as an interested spectator, winds up an active participant. The final part is devoted primarily to Pierre himself and his acceptance of his homeland, in the context of the French troops under Napoleon (Vladislav Strzhelchik) occupying Moscow and resulting fatal retreat that initiated the downfall of his empire. Bondarchuk, in the time-honored tradition of excess of Von Stroheim and others, demanded absolute accuracy in his production on all counts. The costumes are all precisely correct for their respective time periods, and the battle sequences feature the right number of participants on the grounds of the battles themselves. The billion-dollar expense is quite evident on the screen at all times, and the attention to detail alone makes the film worth watching at least once. The first two parts, mostly devoted to peace, unfortunately come off somewhat worse than the later segments that are more focused on war. The peace segments are devoted mainly to grand balls, frivolities and decadences, and occasional political discussions. While the Russian temperament might be satisfied with these factors as entertainment, American tastes will probably find them a bit on the dull side. However, there is some excellent acting here, most notably Bondarchuk himself, who perfectly embodies Pierre both physically and in the context of the story. His evolution from Bonapartist to Russian patriot is nicely detailed, with a number of excellent sequences in the Borodino segment. Savelyeva matures before our eyes, going from petulant young girl to blossomed young woman in a believable arc. Bolkonsky comes off less well, seeming fairly static over a period of ten years. However, he does get a number of good moments himself, notably the intensely personal segment when he falls injured at Austerlitz. 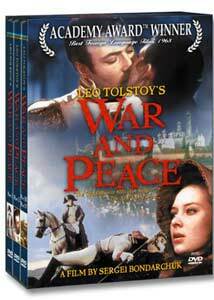 Purists might not be satisfied by Bondarchuk's treatment of Tolstoy's themes. In particular, Tolstoy's rejection of Napoleon as being important as a man, but rather emblematic of the times, seems all but forgotten here. But many of the moments best remembered from the novel are here, such as the coming-of-age wolf hunt by the Rostov family, or Pierre in his white suit being splattered with mud from bombs at Borodino. This seems likely to be as faithful an adaptation as ever will be mounted of the novel, and it succeeds quite admirably on most counts. Image Transfer Review: Unfortunately, Kultur's presentation of this widescreen epic is for some reason only pan & scan. This gives the proceedings an exceedingly cramped feel throughout. One split-screen segment in Part II is presented in widescreen, but stretched anamorphically requiring one to shift on the fly to anamorphic presentation if that's available (the segment is not, however, anamorphically enhanced). Furthermore, the source print is exceptionally rough, with massive amounts of damage and dirt present on virtually every frame. Color is unstable and the picture has an annoying tendency to flicker. The print is murky, tending toward greenish much of the time, and shadow detail is very much plugged up, so that many sequences at night are completely illegible. To top it off, the print is somewhat splicey and there are even occasional video dropouts. The picture is soft and slightly dupey. Audio Transfer Review: The 2.0 mono Russian sound is not very good either. There is excessive hiss and noise (no surprise in vintage Russian cinema), and the music is quite tinny, lacking in depth and range. Dialogue is more or less clear but undistinguished. It's passable, but just barely. Extras Review: Extras are extremely light. A bio and filmography for Bondarchuk are supplied, as well as a short biography of Tolstoy that emphasizes his writing career up to War and Peace. These same extras are present on all three discs for no good reason. The subtitles are burned in, but appear to be done competently. The chaptering on the keepcases is not only incorrect in its numbering (there are 55 listed, but 58 chapters in all), but they're full of spoilers stating exactly who dies. The first and last disc are RSDL; the middle disc is single-layer. While the first two segments are a bit slow going, Bondarchuk's meticulous treatment of the tumultuous year of 1812 make this an unforgettable picture. A poor source print is further marred by being presented in pan & scan only, doing terrible damage to the imagery.